Our new mesh caps are perfect for the avid hiker, runner, or cyclist! The open stitching on the sides of the cap ensure that you can keep cool while you keep the sun out of your eyes. 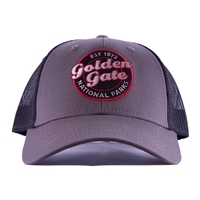 Our new Golden Gate Bridge Visor is a perfect blend of style and utility. The velcro strap ensures a perfect fit, and the long brim will keep the sun out of your eyes, and the sweat off of your face. Each visor features an embroidered logo and text, and packs down small so that you can take it anywhere!